The African Serval is a medium sized cat species, with a long body and very big ears! Serval cats are a small cat species originating from Africa. They have many of the loving characteristics of domestic cats, but they also have an intrinsic wild side, instinctive in their nature. Although they are called small cats, that's a relative term. A domestic cat will be somewhere between about 7 to 20 pounds while the size of an African Serval ranges between 18 to 40 pounds, with males being the largest. Compared to other wild cats however, they are small. The largest of the big cats, such as the Amur or Siberian Tigers, have males that can reach range between 400 to 670 pounds. There are seven small wild cat species that are kept as pets, but the African Serval is one of the most distinctive. They look similar to a small version of the cheetah, but are in fact an entirely different species. These exotic beauties have a wonderful coat that is yellowish to reddish brown with distinctive dark spots and stripes. There are also a couple of varieties including the all Black Serval, and the woodland Servaline which has much smaller spots in its patterning. Servals have a long slender build and long legs. The back legs are slightly longer than the front. Their body form is then complimented with a narrow head and very large, prominent ears. Servals are a swift and graceful predator in the African bush. Everything about the appearance and body form of this cat reflects its natural instincts, behaviors, and abilities. Their coat provides a perfect camouflage, their long back legs provide incredible power in a leap, and they have acute hearing with those large ears. What they lack in size they make up for in speed and agility. They are versatile stealth hunters that will stalk their prey or patiently crouch in the brush listening intently for quarry. With the slightest rustle they leap in a graceful arc, up to 10 feet into the air, pouncing on their prey and striking with a chop of their paws. These incredible cats have a 50 percent success rate, a phenomenal feat in the cat world. Domestically bred African Servals are raised as pets, and are often available. Like domestic cat breeds, they are lively and playful, and become very affectionate and devoted to their owners. They have a loud purr and express affection with endearing head butts. Rather than a meow, they make a chirping sound. Some of their traits can be likened to that of a dog. They can be trained to walk on a leash, and love to play fetch. Serval cats make fascinating pets, but they are not for everyone. They are very active, but are also shy and will take dedicated time and attention from their owner to develop a close bond. Once they become your friend however, you have a companion for up to 20 years. Their size and active nature takes forethought to make your home cat proof. Their nature is such that to keep them in a household with children, or with other pets also takes special consideration, and is not it is not assured that it will work out. Serval cats can be a dream come true for a devoted cat lover, one dedicated to ensuring the health and well-being of this animal as well as the other members of the household. Keep in mind that ownership of lesser cats may be regulated by state and/or local laws. So be sure to check with the authorities in your area to see if permits, licensing, or any other obligations must be met, before obtaining a Serval. The Serval Leptailurus serval was described by Schreber in 1776. It was previously described as Felis serval, the scientific name Caracal serval is a synonym. Common names this species is known by are Serval, Serval Cats, African Serval, Servaline, Poor Man's Cheetah, and Chat-tigre (French). This cat species has a long heritage, and descends from the same Felid ancestor as the Lion. Serval cats have a similar spotted appearance and belong to the same family (Felidae) and sub-family (Felinae) as the fastest animal on earth, the Cheetah Acinonyx jubatus. These two species have a number of traits in common, and it is believed that ancient Servals are the ancestors of the Cheetah. The Cheetah however, can grow up to 53 inches in length and weigh up to 140 pounds, while the smaller Serval only grows to a length of about three feet. The Serval L. serval is a distinct exotic cat species, and not to be confused with the Caracal cat C. caracal. The Serval is closely allied with the African Golden Cat Caracal aurata and Caracal Caracal caracal, but are believed to have diverged from a common ancestor about 5.4 million years ago. Like the Serval, the Caracal also inhabits a broad range across central and southern Africa, as well as the Middle East, Pakistan and India. It is sometimes referred to as the Caracal Lynx as it closely resembles the Eurasian Lynx, and has tufts in its ears. It differs from the Lynx however, with having longer legs and shorter fur. The Servaline cat, once thought to be a separate species, is a small woodland dwelling species. They have the same bold markings, but smaller. Their spots are more like specks on some individuals. An all black species lives in the highland areas of East Africa, such as in the Aberdares Mountain range in Kenya. White Servals have a white background with grayish spots and stripes. These cats have not been documented in the wild, but there have been four born in captivity in the 1990's..
Serval cats are widely distributed across the sub-Sahara, a large expanse of central and southern Africa. They are found in a variety of terrains with the exception of tropical rainforests and the Saharan desert. They inhabit well-watered grassy savannahs and alpine grasslands, dense forested areas along waterways, agricultural lands, and in the east heading to the Mediterranean coast they are found from the semi-desert terrains to oak forests. Hunted for its beautiful striped and spotted coat, the serval is now a threatened species. Some fall prey to natives who also hunt the cat for its meat. In the wild, Servals eat a variety of small to mid-sized prey. The majority of their diet consists of rodents, which is followed by birds the size of Guinea Fowl. They also eat small mammals including hares, hyraxes, and small antelopes such as Duikers and Oribi. On the more exotic side, they will eat frogs and lizards, and occasionally will eat termites, grasshoppers, and even some plants. 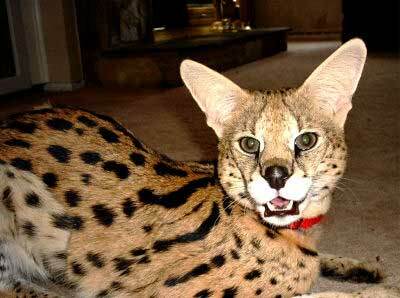 This is a hybrid cat developed from crossing the Serval with the Caracal. Both the Caracal and the African Serval are wild cats with a number of similarities, but they have distinctly different coats. The Caracal has a deep reddish-gray, sand, or gray coat, while the Serval always has a well defined spotted pattern on a lighter background. They are of similar size and there have been documented hybrids resulting from crossings of these two species. These hybrid breed cats are referred to by names such as Caraval, Servical, and Cara -Serval. These are a hybrid cat breed, with the Serval wild cat being successfully crossed with domestic cats. The first successful cross was in 1986 by breeder Judee Frank, who crossed a male Serval, belonging to Suzi Woods, with a natural breed cat, a Siamese female domestic cat. The Servalynx is a non-standard Savannah. They are a very new type of hybrid created by crossing a Savannah hybrid cat with a Pixiebob domestic cat hybrid. These are experimental crosses, bred for short tails, polydactyl feet. and thicker more muscular bodies. They are still in the experimental stage, so not yet recognized by any cat organizations. The Serval is one of the most distinct looking of the small wild cats. They have a wide range of sizes, from 18 to 24 inches tall and can weigh anywhere from 18 to 45 pounds. The body of the African Serval is long and slender with long muscular legs. The hind legs are just slightly longer than the front, and are very powerful. The head is narrow and angular with extremely large ears and an acute sense of hearing. The lush coat is great for camouflage. It has a reddish brown or tawny undercoat and distinctive patterning of dark spots and stripes. The color pattern of each individual is unique. There are also all Black Servals, as well as Servals with much smaller spots and stripes, known as Servalines. As a predator, these are great hunters of rodents, fish, reptiles, and other animals. The coat provides cover, the very large ears provide great hearing ability, and with a vertical leap of 10 feet, make them a great pouncers. The African Serval is a good sized, active cat. They need to have plenty of space to run around and play. It is recommended that they have a cat room of their own indoors and a large pen outdoors.They need large enclosures to keep them comfortable and secure during the night or when they need to be contained. Along with spending time with a Serval around the house, have a special cat room just for this pet. A run or outdoor pen is also necessary as this gives them a place where they can be let out to for exercise. It can be accessible from the cat room or in a separate area. They will also need two litter boxes, large enough for them to use easily. The home must be carefully cat proofed. Servals are avid chewers, and like small children they will put all sorts of things in their mouth and swallow them. So anything that may harm them, from electrical cords to stuffed animals must be taken care of. They are also excellent jumpers. A domestic cat may jump up on a shelf or the fridge and not be a bother, but this is a big animal. When it jumps on the fridge or any other other high place, it will create havoc to anything stored there. It is very important that this cat is not allowed to get out on its own. Even thought they become trusting of their owner, they have an extremely shy nature. If they get loose, catching them is a difficult task as they will run away if chased or frightened. Servals require very little grooming as their coat is short and smooth. It is recommended that you provide two very large litter boxes for them, clean them daily, and replace the litter weekly. Servals can be litter box trained, but training can take some time. They want one or two spots around the house, and once they know where they are, they will use them as long as they are clean and no other pet has used them. The African Serval is a naturally active cat that needs no coaxing to get its exercise. It should be provided with ample room to play and run, be given many toys to play with, and they also love to play with water. These cats enjoy playing fetch and will also enjoy playing in a small kiddie pool. In their natural habitat, Servals primarily hunt alone. But in the absence of suitable small prey they have been known to team up on larger animals. While servals are well adapted for hunting by jumping and snaring or pouncing, they seem very skilled at probing holes with their long forepaws. Servals in captivity will frequently stick their paw in ones pocket to fish around for interesting items. In the wild, the mating season varies in different regions, and some females will give birth twice a year. A female will attract a male with a mating call, then she purrs and rubs her cheeks against the male to indicate she is ready to mate. The female will give birth in a den hidden in dense vegetation, that's lined with dry leaves. Litters usually consist of one to four cubs. The cubs are helpless and blind at birth. The mother will nurse them for many months, up to a year, until they are ready to fend for themselves. At that time the female will force them out. Young Servals will travel long distances to establish their own territories. They will then remain close to that area for many years. Servals constantly mark their territory, and have been documented to mark close to 50 times in a single hour. Servals need the same types of vaccinations as domestic cats, but they must be dead virus vaccines. These are generally healthy cats, but they do have a propensity to swallow foreign objects which can become lodged in their throats. If this happens, they will need veterinarian assistance to remove them. For in-depth information on Serval medical care see Serval cat health, vaccinations, spaying or nuetering, and more. Domestically bred Servals are available from breeders, and can often be found on the internet. Where can I buy this cat and how much it costs..
Fennec foxes available contact for info and photos. do you have any F-1 left or serval kittens and what is the price on the f-1 and then serval.